Don't try this at home. The bellyflop is not a dive for the faint-hearted. Let alone from 35 feet up into 12 inches of water, a new world record. Arms outstretched, Darren Taylor propels himself off a platform high above a pool. If this were the Olympics, he would perform a series of tucks and spins before blading cleanly into the water, making as little splash as possible. But Taylor is a professional shallow diver, and he executes the "mother of all bellyflops" into a paddling pool holding just 30cm of water. His latest jump is the new world record and this month he hopes to do a 40ft dive. How does he do this and survive, let alone walk away with just bruising to his chest and legs? By making a massive splash when he lands, with arms wide, chest expanded, back arched, chin aloft. 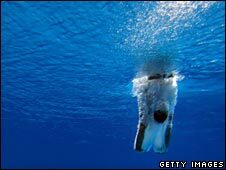 It's all about increasing the time during which he decelerates from 30mph to 0mph, says physicist Caitlin Watson, by maximising the body surface hitting the water surface. She makes the analogy of driving a car into an obstacle. "If you hit a brick wall, that's an instant deceleration and it may kill you. But if you drive into an enormous bag of feathers, that slows you down more gradually," says Ms Watson, of the Institute of Physics. So rather than assume the dive-bomb tuck familiar from childhood - a position which is too streamlined - Taylor spreads himself out. "He has a lot of kinetic energy [energy of motion], and that energy will be transferred to the water as the noise you hear, the water splashing out of the pool and the heat created on his body. The skin on his belly and legs will get warm, in the same way that if you clap your hands together hard, they feel warm." And the mattress underneath the 10ft by 5ft paddling pool - a safeguard to comply with Guinness World Records regulations - also absorbs some of the force of his landing. "That's not concrete he's landing on." 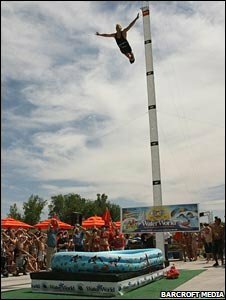 High divers, by contrast, aim to enter the pool with barely a ripple - their deceleration comes under water, which is why diving pools are so deep. The kinetic energy of their fall converts not to a splash, but a roil of bubbles beneath the surface. Having executed a series of mid-air somersaults, a high diver's body must be as vertical as possible on entering the pool, arms overhead, body straight, toes pointed. Taylor's build may also help, being thickset and muscular like a wrestler, rather than having the lithe physique of a champion high diver. "Wrestlers are big chaps, muscular, used to absorbing a lot of force," says Ms Watson. "And holding his chin up helps prevent whiplash - the head is already back. If he landed face down, that would expose the delicate face to the full force of the landing." Taylor, 47, of Denver, Colorado, has spent more than two decades perfecting his shallow dives. And unlike the amateur bellyfloppers at the local swimming baths, he also understands the mechanics, having been a champion high diver in his youth. Perhaps Team GB has a future record-breaker in 14-year-old Olympian Tom Daley, who surely knows how to reverse his usual high board techniques in order to perfect the bellyflop.